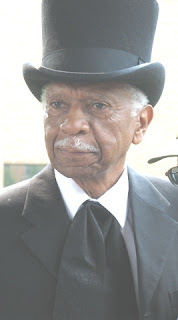 On July 1, 2012 at 2 p.m. at the National Abolition Hall of Fame and Museum (NAHOF) to which Frederick Douglass was the first inductee, David A. Anderson Ph.D. Visiting Scholar at Nazareth College of Rochester will present an oration of Douglass’ speech asking what Independence Day meant to the American slave. A founding member of Akwaaba: the Heritage Associates, Anderson is an interpreter of living history through reenactments that evoke Frederick Douglass, Austin Steward, unheralded escapees, et al. Often the theme addresses the essential role African American Union soldiers played in freeing a people and preserving the Union. He has presented such recreations at symposia in North Carolina, Pennsylvania, New York, Ohio, and in other venues. Anderson chairs Rochester-Monroe County Freedom Trail Commission, which in 2003, took the lead in staging, &#8220Men of Color, to Arms!&#8221 a conference illuminating Frederick Douglass’ role in overturning policies barring African Americans from the Union Army. 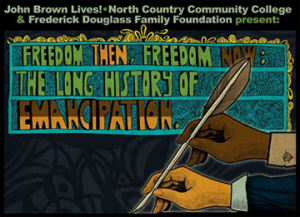 In 2007, with the National Underground Railroad Freedom Center inCincinnati, the Commission co-sponsored the Frederick Douglass International Underground Railroad Conference. In June 2009, Anderson joined other honorees at the National Mall in Washington in “Giving Voice: The Power of Words in African American Culture,” an exploration of the expressive power of the creative African American oral traditions in the shaping of American culture. Douglass spoke at anti-slavery conventions in Peterboro and in the Free Church of Peterboro which Gerrit Smith had established. Douglass worked with Smith in organizing the 1850 Anti-Fugitive Slave Law Convention in Cazenovia, New York. Smith made large and regular donations of money to Douglass in order to keep solvent Douglass’ anti-slavery efforts through his newspapers The North Star and Frederick Douglass’ paper. Douglass dedicated the second edition of his autobiography to Gerrit Smith whom he considered a great man because of his practical efforts to implement universal human rights. Douglass’ relationship with Smith was also on a very personal level. He visited Peterboro often, bringing with him colleagues and other members of his family for extended visits as early as 1835. Following the two o’clock program, Norman K. Dann PhD, a Gerrit Smith biographer, will conduct a tour of Douglass’ steps at the Gerrit Smith Estate describing the relationship between the two men. 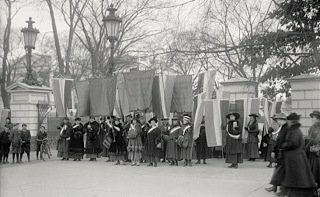 This program is supported by a grant from the New York Council for the Humanities for the Abolition Agitation in New York Sparks War for Liberty and Justice for All2012 NAHOF project. Admission to the program and to the exhibits at the National Abolition Hall of Fame and Museum, 5255 Pleasant Valley Road in Peterboro is three dollars and free to students. It was an unusual partnership: a runaway slave and a wealthy New York landholder. Gerrit Smith and Frederick Douglass were drawn together by a shared commitment to ending slavery and guaranteeing equal rights for all. Their friendship began tentatively in the late 1840s at about the time Douglass launched his first newspaper, the North Star, in Rochester NY. It solidified in the early 1850s and contributed to Douglass’ acrimonious break with his original abolitionist associates, the followers of Boston editor William Lloyd Garrison. His growing ties to Smith enabled Douglass to leave the narrow ideological orbit of the Garrisonians and join the growing ranks of the northerners pursuing political antislavery tactics. John R. McKivigan Ph.D. will speak further on his studies of this unique partnership during his keynote address The Gerrit Smith &#8211 Frederick Douglass Partnership for the annual dinner of the National Abolition Hall of Fame and Museum on Saturday, October 22, 2011 at the Hall of Presidents at Colgate University in Hamilton NY. Douglass and Smith were two of the most influential, respected, and powerful abolitionists in our nation. Both reformers were among the first five persons inducted into the National Abolition Hall of Fame and Museum in Peterboro in 2005. McKivigan will focus on the collaborative work of these two famous men. Dr. McKivigan received his Ph.D. from Ohio State University and is currently a professor of United States History at Indiana University-Purdue University at Indianapolis. McKivigan, a respected scholar of the American anti-slavery movement, was an adjunct member of the History and Afro-American and African Studies Department at Yale University from 1979 to 1989 and series co-editor of The Frederick Douglass Papers 1989 to 1992. Since 1994, McKivigan has been the director of the Frederick Douglass Papers, a documentary editing project supported by the National Endowment for the Humanities and the National Historical Publications and Records Commission. McKivigan co-authored research articles on Gerrit Smith as early as 1983 with such works as The Ambivalent Six, He Stands like Jupiter: The Autobiography of Gerrit Smith, and The &#8216-Black Dream’ of Gerrit Smith, New York Abolitionist. 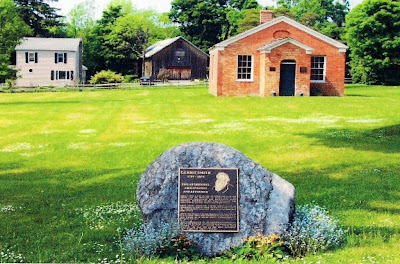 The collaborations of Douglass and Smith will be revisited at 10:00 a.m. on Sunday, October 23 at the Gerrit Smith Estate National Historic Landmark and the National Abolition Hall of Fame and Museum in Peterboro when Dr. McKivigan and Dr. Norman K. Dann walk together among the structures and exhibits on abolition and the Underground Railroad further discussing the partnership of the two men and the words and deeds that transpired from their times together in Peterboro over 160 years ago. C. James Trotman Ph.D. will close the Upstate Institute afternoon symposia at 3:30 p.m. on Saturday, October 22 in Golden Hall at Colgate University with a tribute to Frederick Douglass as the Pioneering Reformer. Dr. Trotman is professor emeritus and the founding director of the Frederick Douglass Institute at West Chester University PA. Dr. Trotman presented for the Hall of Fame commemoration of Douglass in 2006. The public is encouraged to attend parts or all of the annual National Abolition Hall of Fame and Museum event. For the complete schedule and the registration form: www.AbolitionHoF.org or contact info@abolitionhof.org and 315-366-8101. In August 1850 Gerrit Smith and Frederick Douglass organized a two day convention of abolitionists to protest Congressional debate on the proposed Fugitive Slave Act of 1850. 2,000 people attended the meeting in Cazenovia which Ezra Greenleaf Weld captured in the famous daguerreotype image owned by the Madison County Historical Society in Oneida NY. At 2 p.m. on Sunday, August 21, the 151st anniversary of the first day of that Cazenovia Convention, Norman K. Dann Ph.D. and W. Edward Edmonston Ph.D. will present Protest to the 1850 Fugitive Slave Act. Norm Dann, professor emeritus Morrisville State College, will provide a brief chronology of the events that led to the second of two laws to return escaped slaves, and outline the horrendous intent and the dreadful impact of the law on slaves and free citizens. Dann is the author of Practical Dreamer: Gerrit Smith and the Crusade for Social Reform (2009), a Steward at the Gerrit Smith Estate National Historic Landmark, and a founder and member of the Cabinet of Freedom for the National Abolition Hall of Fame and Museum. Bill Edmonston holds Ph.D. in Clinical Psychology and taught for four years in the School of Medicine, Washington University (St. Louis) before coming to Colgate University where he taught Neuroscience/Psychology for 29 years. While at Colgate he was named New York Professor of the Year and a National Gold Medalist in the CASE Professor of the Year Awards program (1988). Edmonston also held a Fulbright teaching fellowship (1982) at the University of Erlangen, Germany. Edmonston has published three professional books, one book on the American Civil War, and two mystery novels. From 1989 to 2005 Bill and his wife Nellie, had a small publishing firm (Edmonston Publishing, Inc.) that specialized in original journals and memoirs of the American Civil War. Learning of the Cazenovia Fugitive Slave Law Convention through the publishing company’s participation in the Annual Peterboro Civil War Weekend, Edmonston became especially curious about two aspects of that convention: 1) The Edmonson sisters, and 2) the lack of a pictorial depiction of the meeting other than the well-known daguerreotype. The Edmonson sisters, who escaped slavery and who were in attendance at the Cazenovia meeting, had lived in the same area of Montgomery County, Maryland, where Bill’s ancestors had resided and held slaves. Knowing that the family name is variously spelled, Edmonston set upon a search for a possible common ancestor with the Edmonson sisters. In 2010 Bill created an oil painting of the central figures of the Cazenovia Convention daguerreotype and donated it to the Gerrit Smith Estate NHL. Bill took up painting about a dozen years ago, and paints “whatever strikes my fancy,” including landscapes, seascapes, cityscapes, still-life, people, and trompe l’oeil. Bill’s oil paintings have appeared in shows in Cooperstown, Utica, Old Forge, Albany and other venues in the upstate region. His works are in private collections in Philadelphia, New York City, Virginia Beach, Munich, Germany and the Central New York area. The public is encouraged to attend the program at the Gerrit Smith Estate National Historic Landmark, 4543 Peterboro Road / 5304 Oxbow Road, Peterboro NY. Admission is two dollars. Students are free. This program is one of a series of programs provided by the Stewards for the Gerrit Smith Estate National Historic Landmark during 2011 and partially supported by a PACE grant from the Central New York Community Foundation. The Gerrit Smith Estate National Historic Landmark and the National Abolition Hall of Fame and Museum are open from 1 – 5 p.m. on Saturdays and Sundays from May 14 to October 23 in 2011. 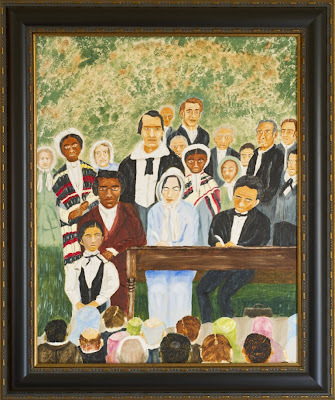 Illustration: Oil painting created by Bill Edmonston of 1850 Cazenovia Convention organized to protest the Fugitive Slave Bill. Hundreds of fugitives from slavery escaped every year to New York City. They were forwarded to Albany and onto Champlain Canal packet boats. 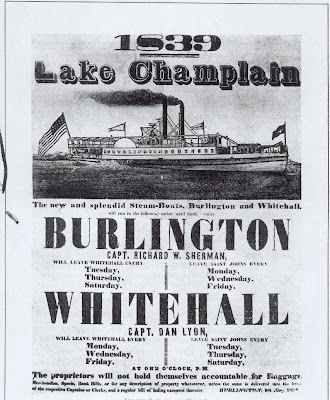 At Whitehall they boarded the Burlington. From Port Kent, they could make their way to Keeseville and Stephen Keese Smith’s farm in Peru. Smith hid fugitives from slavery in his barns and drove them in his uncle’s wagon to Champlain. Then Noadiah Moore took them across the border to Lacolle, Canada, and helped them find work. They were free, at last. People opposed the abolitionists. Friends and neighbors turned against them. Brethren left their churches. “Villages and Churches Divided” is a 5th Annual Canal Splash! event. Canal Splash! celebates the history and culture of New York’s Canals.